Alpha Video has released a set of all three of their Houdini silent film DVDs for one price. 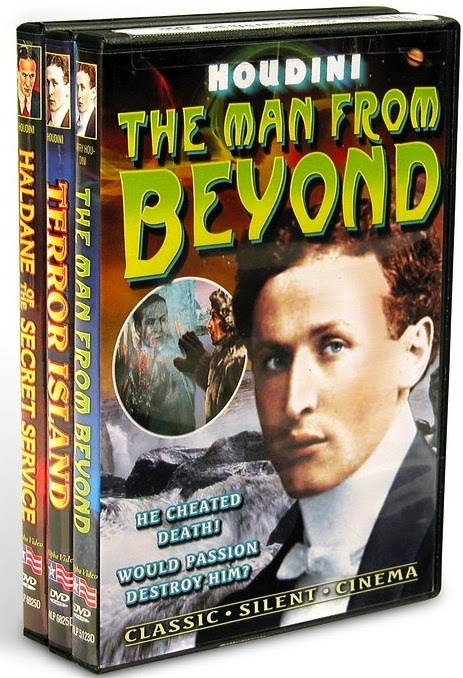 The set includes Haldane of the Secret Service, The Man From Beyond, and Terror Island. While these Alpha releases tend to be nothing special as far as the prints are concerned, Alpha does go the extra mile with nice cover art and menus. 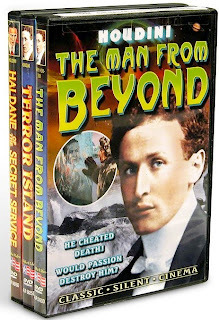 Their release of Haldane of the Secret Service is the only stand alone DVD release of Houdini's last film. You can purchase Alpha Video's Houdini DVD three pack from Amazon.com or Oldies.com. By the way, Alpha's DVD of Mystic Circle Murder (aka Religious Racketeers -- the 1938 Bessie movie) is currently on sale for $3.99 at Oldies.com. Why not make it a four pack!